J/News Articles: Team MBR (McGuffin Brothers Racing) Racing a J/24 to Alaska!? Team MBR (McGuffin Brothers Racing) Racing a J/24 to Alaska!? 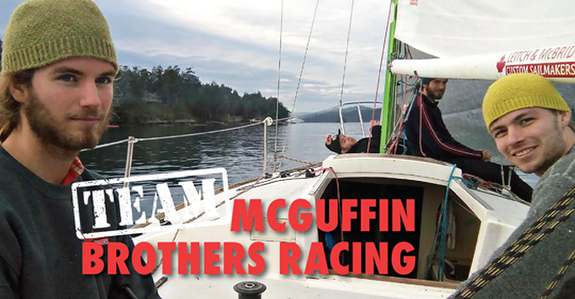 It was in 2018 that four brothers in their late teens/20’s stopped whatever activity they were doing on Salt Spring Island (British Columbia), stared at the R2AK Race that swarmed around their island, and reached a collective conclusion: “There is an undefinable but compelling reason that we are drawn into this adventure,” and Team McGuffin Brothers Racing was born out of its own name. At ages 18, 19, 19, and 22 years old, they are dead even with youngest team to ever enter. The team members include Cianan McGuffin, Finn McGuffin, Callum McGuffin, and “brother in arms” Conner Ekelund. Who are these ripped young’uns from the generation Millennials? Combined, they are sailors who dinghy train on 49ers every week, paddle a SUP 40 miles at a clip, hike the trails, paddle dragon racing canoes, amongst many other outdoor activities. Short version: these guys aren’t waiting for life to happen, they’re happening to life. Our favorite part: their goal is to use their soon to be R2AK-glory to springboard themselves into the world of professional sailing. Their words: “We don’t see how Oracle Team USA could refuse us after we’ve completed this race!” Two words: Larry Ellison. While their guidance counselor might have just drank the other half of the bottle, she can rest easy on her desktop knowing they at least chose a boat well-suited as any for taking them to the land of salty opportunity. The J/24 might be the world’s most ubiquitous racing sled for this or any race. Its got a keel to keep the wet side down, flared sides to keep the saltwater off the dry side, and a tiny cabin to create a bubble of sleepable moistness between the rain and sea. There are over 5,400+ of these things charging around the buoys worldwide. If you run the numbers, like we didn’t, literally at any given moment there are no less than seven J/24s sailing or nearly sailing, somewhere around Mother Earth! That’s astounding! As far as we know, so far not one of them has gone engineless to Alaska!? Cool. Note- these guys will be using oars, or maybe propellers driven by bicycles, in addition to other things to propel themselves along the tortuous route to the finish line.